We’ve been spending time in Leadville for the good part of two decades and we’ve seen this town go through some changes. However, it’s never lost that Wild West charm that makes it an authentic slice of Colorado and the Rocky Mountains. We visited Leadville in December and it was frigid. Even with gloves on my fingers were stiff and nearly frozen as we walked around town. Leadville should be cold in the winter. 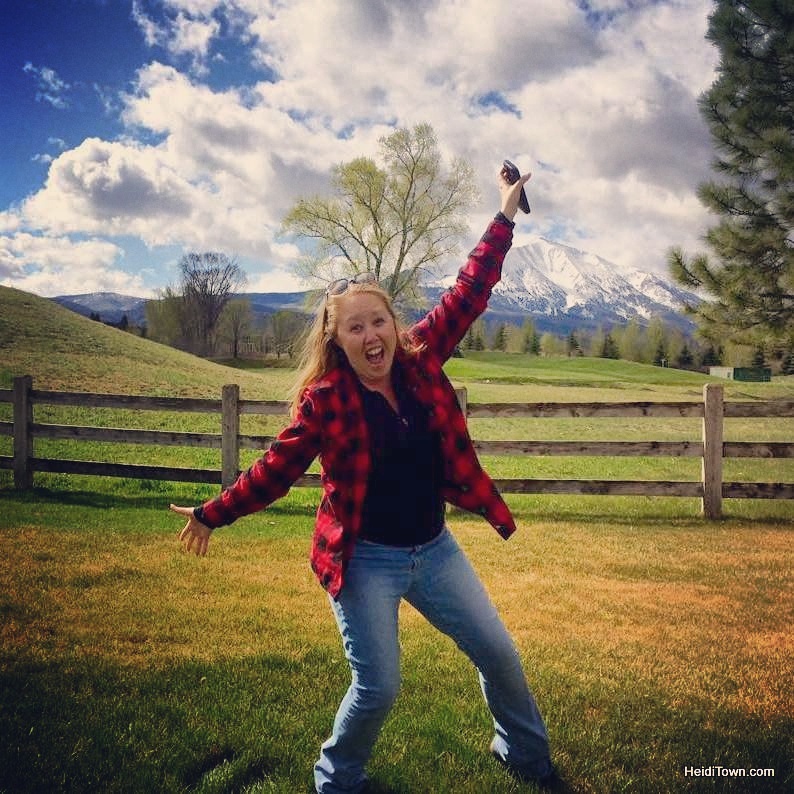 At 10,151 feet above sea level, it is the highest incorporated town in the United States. 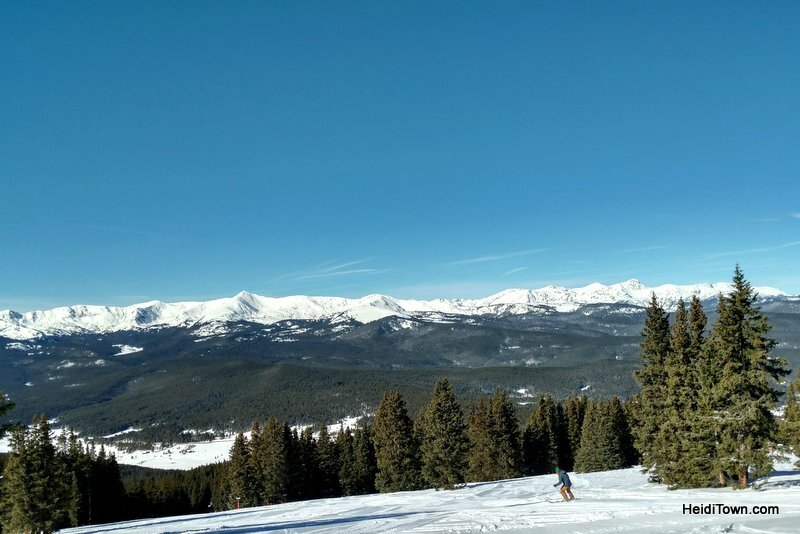 Leadville’s local ski area, Ski Cooper, depends on white stuff to fall directly from the sky and is one of the few ski areas in Colorado that doesn’t make snow. Although it feels remote, Leadville is under two hours from Denver, making it an easy weekend getaway for those along Colorado’s Front Range. On the first night, we checked into our tiny home (via phone) and then walked the short distance to The Manhattan Bar to warm up with a drink. We’d never visited this bar before and it feels like it’s been open since the beginning of Leadville. Drinks are stiff and early in the evening, the company was good. We’d immediately struck up a conversation with locals who told us all the best snowshoeing and cross country skiing. 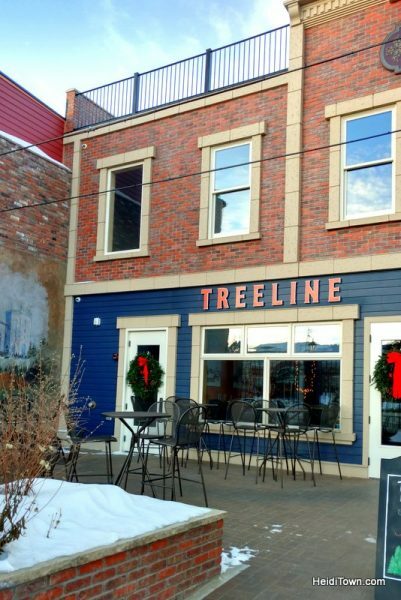 We had reservations for dinner at Treeline Kitchen, a new restaurant in downtown that’s been warmly welcomed by locals. After eating there, I know why. Treeline Kitchen’s ever-changing menu means that patrons have new options on each visit, a big deal in a small town. There’s a mountain-modern feel at Treeline Kitchen, with succulent plants on the wall and local liquor on the shelves of the large, wrap around bar. I saw lots of local spirits here including Wood’s High Mountain Distillery from Salida and Deerhammer from Buena Vista—both towns are just down the road. Dinner started with smoked salmon dip served with crackers and some of the best falafel I have eaten and growing up as a vegetarian, I’ve eaten a lot of falafel. The falafel appetizer was served with cooked carrots and beets which was the one part of the meal I could have done without. Cooked beets do not do much for me. 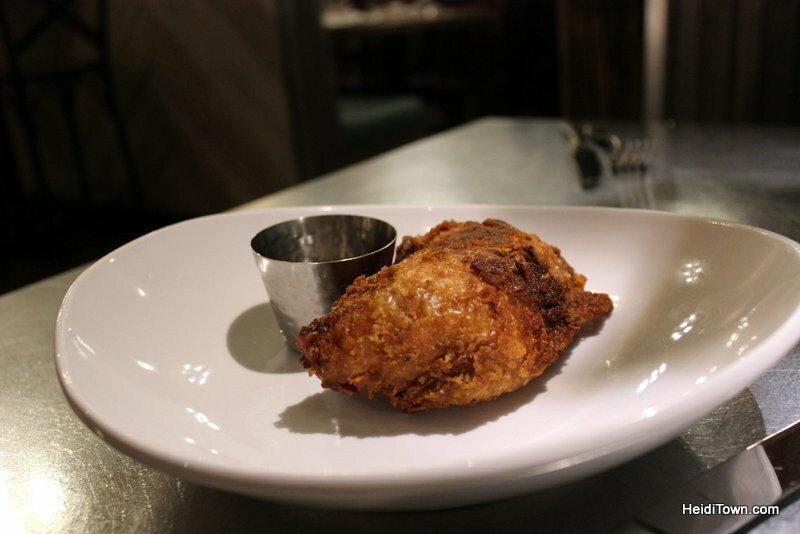 They also brought a side of the fried chicken because I adore fried chicken. It is scrumptious and thankfully reheated well in our tiny house microwave because we had a lot of food at Treeline Kitchen. The staff is well-acquainted with the menu so ordering is a delightful conversation about the food. 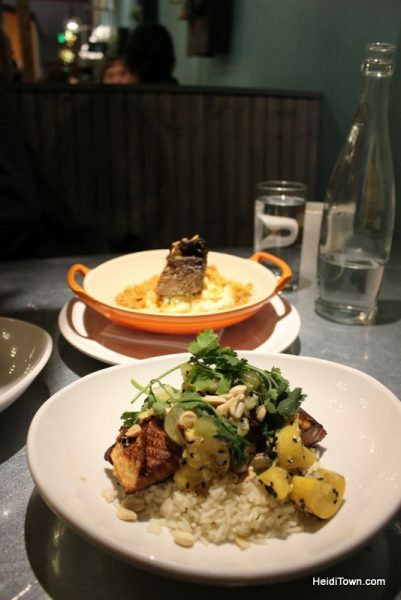 As an entree, I had the salmon special on a bed of rice with cucumbers, squash and pine nuts. Being from the Seattle area, I am picky about the cook on my salmon and this one was perfect. Given that I was sitting approximately 1200 miles from the nearest ocean, I give my sincere kudos to the chef. Ryan ordered the melt-in-your-mouth ribs and despite being stuffed, we ordered a tasty banana, chocolate dessert, which meant we rolled back to our tiny house on 2nd Street. 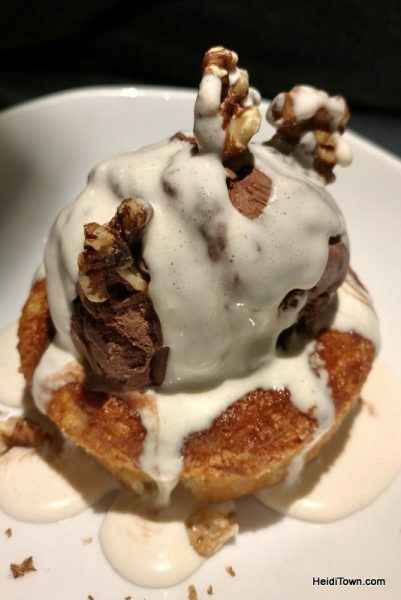 With a constantly changing menu, I can’t promise that our exact meals will be available when you visit Treeline Kitchen, but I have faith that you’ll be quite content with any of menu options here. The next morning we fueled up on cheesy chorizo breakfast burritos at City on the Hill, a coffee shop that’s crazy popular with locals and visitors. We got there right before the line got long. During the summer, I’ve seen the line out the door. I’ve been going to City on the Hill for years and it never disappoints. In addition to breakfast items, they serve top-notch coffee. We spent the day at Ski Cooper where Ryan skied and I snowshoed. 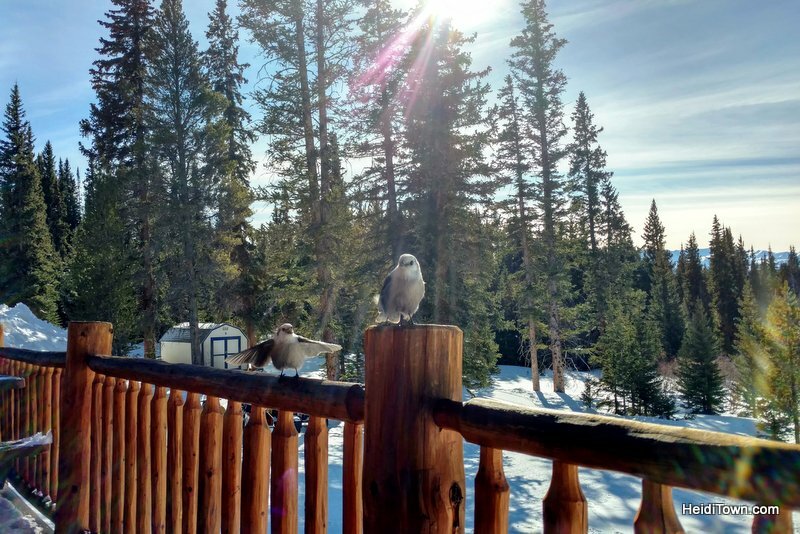 I also enjoyed a cup of coffee and communed with the blue jays at Tennessee Pass Nordic Center, which is in the same parking lot as Ski Cooper. We ate lunch at Katie O’Rourke’s, a tiny Irish bar located at Ski Cooper, in the former location of the retail store. The store is now located in the same building as rentals. Ski Cooper’s base is compact with everything at your fingertips so getting around in a breeze and the rental process is fast and easy. Two things struck us about Katie O’Rourke’s. First, the food is good, a chicken sandwich for me and a Reuben sandwich for Ryan. We shared a plate of the addictive rosemary fries. The second thing we noticed is the number of craft brews from Colorado mountain breweries on tap at $6 a pint. That’s affordable beer when you take into account that this is a ski area. By the way, there is on-mountain dining here at the Ridgeview Cafe yurt. Believe it or not, there are a few towns around Colorado without a brewery and I am so glad Leadville is not one of them. 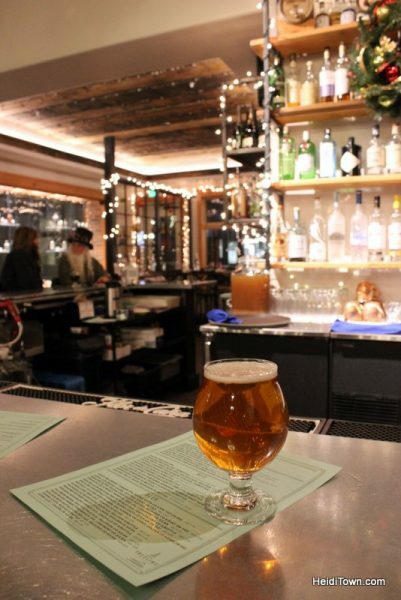 We stopped in at Periodic Brewing for a pint after a day on the slopes and beer hit the spot. We were tired, so we opted for the ease of a High Mountain pie for dinner. Close to our tiny house, it’s a pizza place we’ve been going to for years because it’s just plain awesome. There’s usually a huge crowd but this evening was quiet. 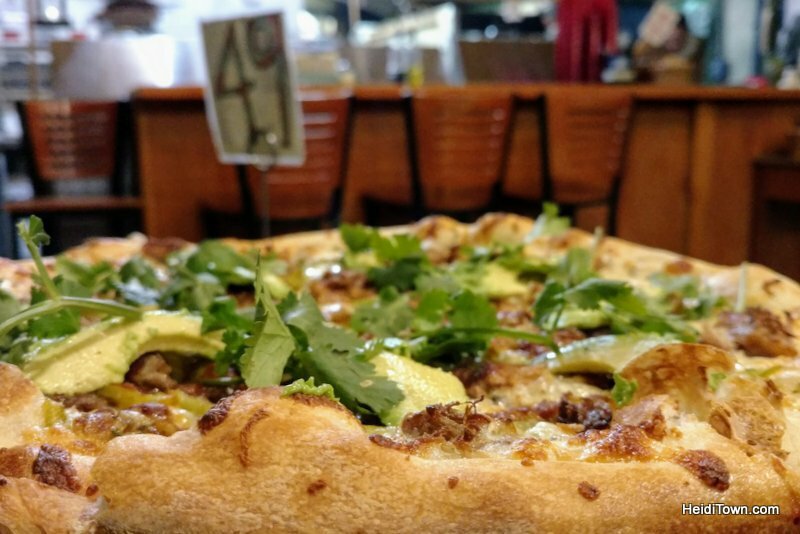 We ordered the San Luis, featuring pork, green chiles, fresh avocados and cilantro. It doesn’t get more Colorado than this pizza and it put a big smile on my face. 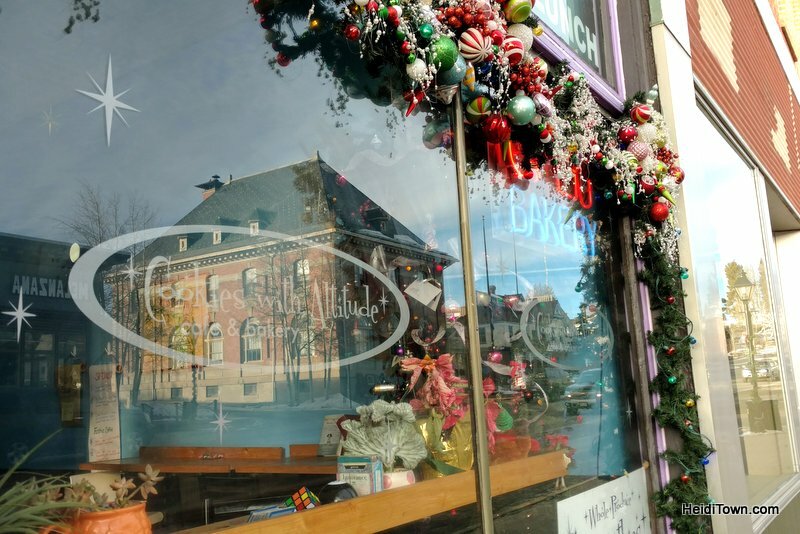 On our last morning in Leadville, before a day of snowmobiling with White Mountain Snowmobile Tours, we breakfasted at Cookies with Altitude. 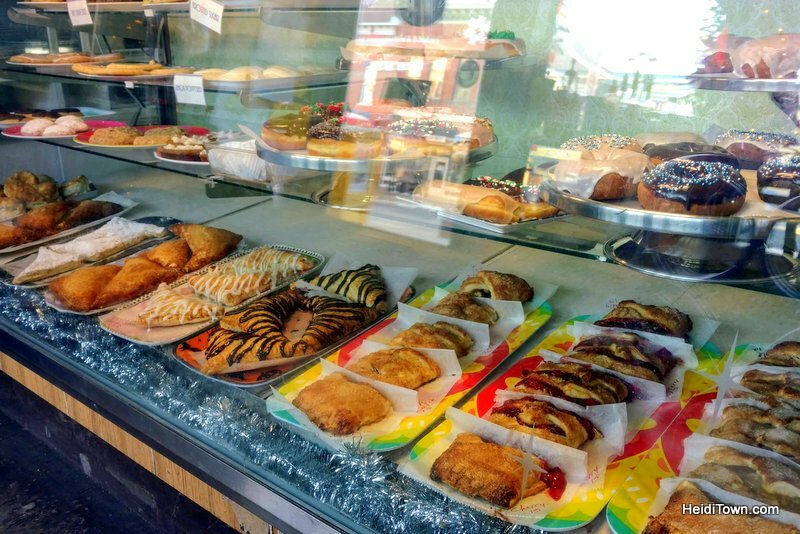 Serving up a beautiful array of baked goods such as donuts, pastries and of course, cookies, this place opens at 5 a.m. Monday through Saturday and 6 a.m. on Sunday making it a great choice for early morning breakfast in Leadville. I ordered the special, turkey sausage and biscuits for under $6. I am generally skeptical of turkey sausage but this was a steaming bowl of deliciousness. The fresh biscuits were covered liberally in gravy and I would order it again. Ryan had a bagel sandwich and a donut. Our takeaway? Cookies with Altitude delivers good eats. Start planning your trip to Leadville at LeadvilleTwinLakes.com, and I’ll see you in town for the 71st Leadville Ski Joring on March 2-3, 2019. Thank you to Visit Leadville for hosting us on this visit. You guys stayed across the street from the Pastime, wondering why you didn’t go in and try the food there? Thanks for stopping by HeidiTown, Dawn. We didn’t make it to Passtime but I have since learned from several people that they serve up amazing hamburgers so we’re going to try to go there during ski joring. That’s when we’ll be back in town! The Pastime’s chicken wings are the best! Hand cut fries are hit and miss as they tend to get over done sometimes… I won’t go to City on the Hill because of some of their business practices. I don’t care for the brewery as the people running the place were rude and condescending. Treeline? My niece worked there. Won’t go there either. 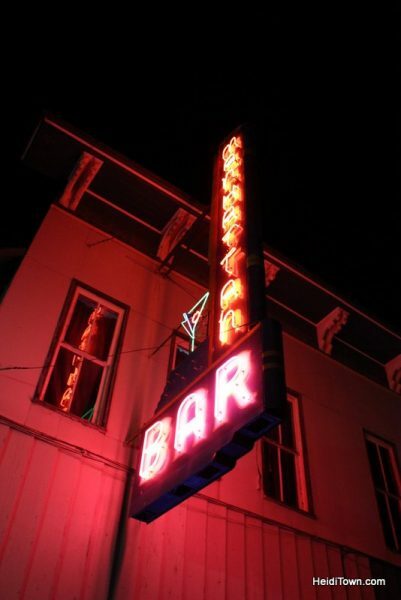 BUT the Pastime is an authentic Leadville bar that was part of the red light district back in the day. We will make it to Pastime. 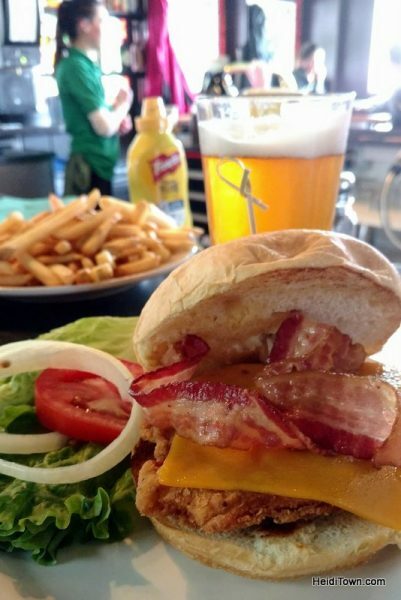 I keep hearing that I missed out on one of the best burgers in the mountains. Hoping to make it there during Skijoring & Crystal Carnival weekend. Thanks for stopping by HeidiTown, Geo! Many locals are NOT happy that Treelike chose not to keep the architecture of the old west but instead look modern. Also, the prices are much higher than most of the year row d locals can afford. Their prices are more.fitting for Vial. I’ve spoken with several people who will not darken their doors again.